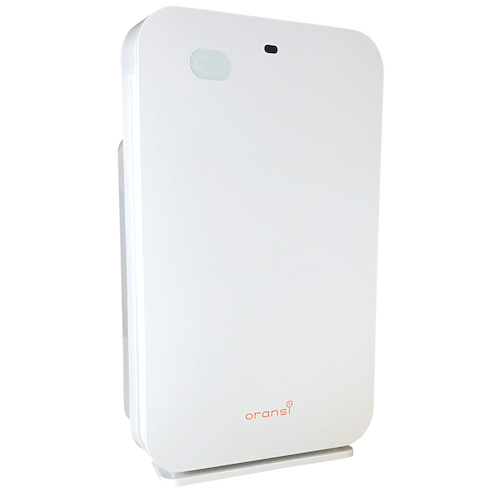 The Oransi OV200 air purifier uses a combination pre-filter and HEPA filter to remove pollen, dust, mold spores, pet dander and bacteria from the air. This air cleaner also has an activated carbon filter for the removal of light odors, gases and VOC’s. The user interface is intuitive and can be controlled at the air purifier or with the remote control. The key benefits are that the air purifier is easy to use, has very high filter performance and a modern design. This purifier has a filter replacement indicator and air quality sensor. This is a new air purifier we began rating in 2017 and will continue to update this page with customer reviews. The OV200 air cleaner is simple to set up and operate. After removing the front cover to remove the hepa and carbon filters from the sealed bag, it was just a matter of plugging in the purifier to be operational. The power controls are very intuitive and access to the filter requires removal of the front cover which is easily detached. The pre-filter can be wiped or vacuumed lightly to clean as well. As we have found with most other air purifiers, the units come with the v-HEPA air filter. We found the user interface and remote control easy to operate. Based on our testing the OV200 can effectively clean rooms in the 320-400 sq ft range( 20’ x 20’). The noise level at the highest fan speed is louder than some users would want while in a bedroom. However we found the vOV200 air purifier to be quieter than most other HEPA air purifiers we have tested. We did not test the noise level in our lab however the air purifier specifications list the noise level at 40-60 dB which is average for a tower model. On the lowest fan speed setting the OV200 was very quiet. The OV200 air purifier removed over 99% of the particles that were passing through the air purifier based on our particle counter. This places the OV200 air purifier among the top of all air purifiers tested. In searching the web for customer reviews we found most reviewers purchased for bedroom use and were most interested in a high performance air cleaner to remove allergens such as dust, pollen and mold. Most commented on the design as being elegant and providing fresh air. The performance, design and feature set of the air purifier get most of the attention with users commenting on the design, small footprint, feature set and air cleaning ability. There are mixed reviews on the noise level - some comment that the OV200 as quiet while others reported the high speed being too loud. A negative is that this is not designed for larger living areas and works best in a bedroom or office sized room. Source for consumer reviews: brand site and Amazon .